Today marks six years since we first launched Crazy4Jigsaws. We've come a long way in those six years and done a lot of growing! We now have tens of thousands of members in over 150 countries. Every day people from all over the world come to solve puzzles together. We have truly become a global community of puzzle lovers! Thank you for all of your love and support. It's the amazing members like you who help make this site such a fun place to play jigsaws. Here's to another six wonderful years! Did you know that we have over 300 items available to redeem in the Puzzle Point store? All of those icons, backgrounds and wallpapers were getting a bit cluttered and it was getting harder and harder to find the unique item that you were looking for. To make everything more organized we just added new category and filtering options to the left navigation bar. You can now easily filter by the item type and category to find the perfect item to redeem. Want a new flag icon? Or how about getting back to nature? Hungry for a food icon? Whatever your taste or style, the new filter and category options make it easy to find exactly what you are looking for. One of the recently requested features for the site has been the ability to opt-out of publicly posting your solve times. We're pleased to announce that we have now implemented this feature. By default all members' solve times are publicly posted to the "Fastest Solve Times" scoreboards. The new solve time option allows you to turn off posting your solve times for all future puzzles that you complete. Visit the account page and find the setting for "Post Solve Times". Click the "disable" button to disable posting solve times. Many of the amazing features on Crazy4Jigsaws were suggested by our members. If you have a great suggestion for the site, contact us and let us know about it! We're always looking for new ways to improve your puzzling experience. 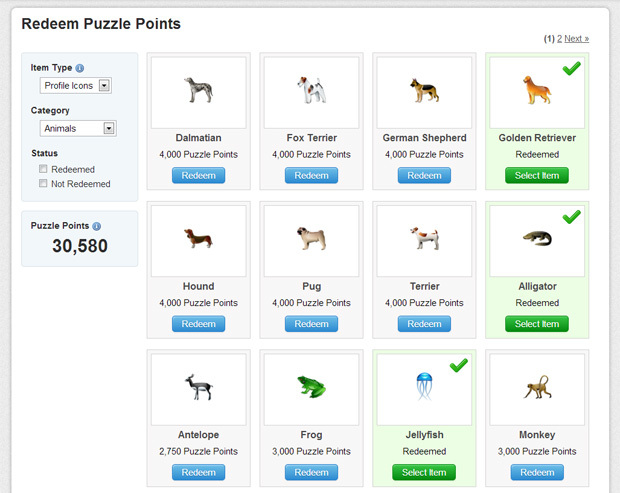 Today we're introducing our brand new puzzle gallery layout. Now you can enjoy larger, clearer preview images of your favorite jigsaw puzzles while surfing through the puzzle gallery. Take a look at the difference in the image sizes below. We hope this change will make it easier to find the perfect puzzle to complete. Enjoy! Cool off this summer with our new ice cream icons! Redeem your Puzzle Points for these frozen treats here.